Filipino boxer Jhon Gemino knocks out the Top Rank fighter Toka Kahn Clary in the very first round of the fight Today September 24, 2016, at Osceola Heritage Center, Kissimmee, Florida, USA. 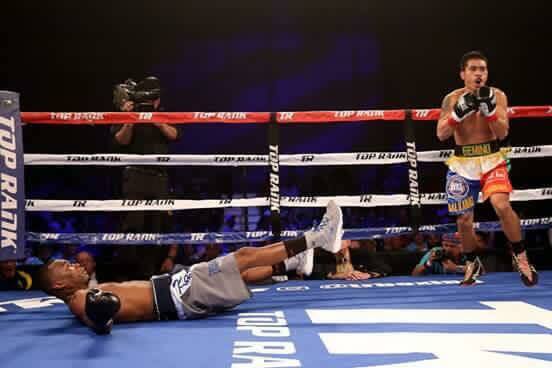 The Filipino shocks the world after beating formerly undefeated highly rated boxer Toka Kahn Clary. Gemino becomes a favorite fighter after the big upset. Gemino countered and connects to the body then follow up with a right hook to the chin that puts Klary down. Klary won't able to get up and the referee stops the fight at at 1 minute 30 seconds of the very first round. Gemino wins improved his record with (15-7-1, 6KOs) while Bob Arum boxer Klary dropped his record with (19-1, 13KOs).